Create a solid hold with Flipbac Camera Grips! Greatly improve the handling of your camera. 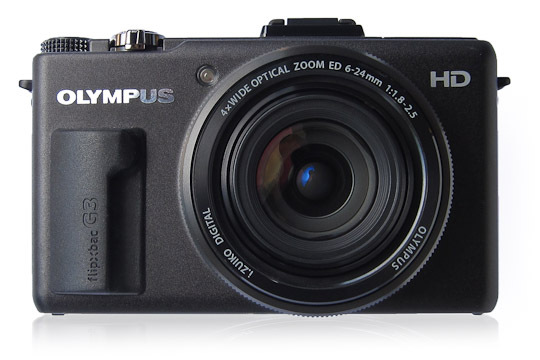 Many point and shoot digital cameras have no grip and a smooth finish. Even though a camera may be small, it is often difficult to hold and can slip out of your hand. Flipbac Camera Grips can be easily applied to the front of your camera to prevent slipping and create a solid hold, making your camera more secure in your hand. One-handed picture taking is easier and safer. Side view G1, G2, G3. 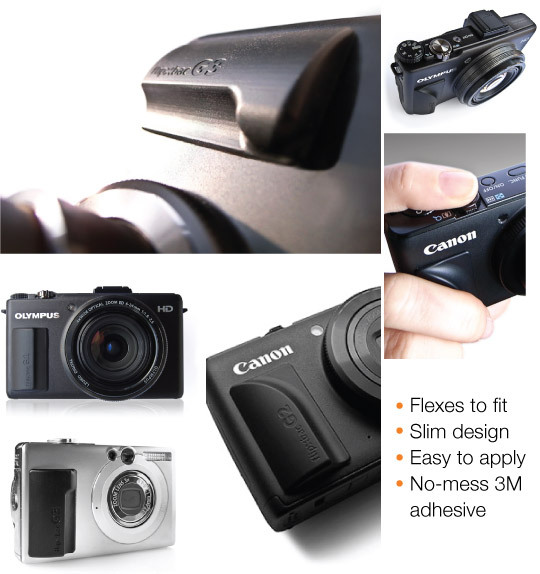 The Camera Grip G4 will fit over the small grip-strip found on popular cameras such as the Canon S100 and Nikon V1, as well as other cameras lacking a grip. It features a leather grain texture, made of high grade silicone and quality 3M adhesive. When mounted on the camera, the G4 Grip handsomely adds form and function as if a “factory finish”. 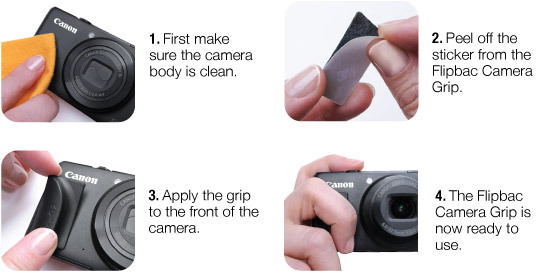 The no-mess 3M adhesive has a strong, secure hold but also allows the grip to be removed without leaving residue or damaging the camera body. After removing the grip, cover the adhesive with the original backing material for storage so that you can reattach the grip.